It took A.I. Artificial Intelligence nearly 20 years to finally make it past the development stage and onto movie screens. As far back as the early 1980s, the late Stanley Kubrick, inspired by the Brian Aldiss short story Supertoys Last All Summer Long, toyed with the idea of a film about an artificial child programmed to replace the real thing. Kubrick, not famous for brevity, spent years contracting various script drafts and concept art, but he was never able to progress much past that. He even brought his good friend Steven Spielberg into his confidence on the project, ultimately deciding that the subject matter was more suited to the emotional sensibilities of the most successful commercial director of all time. Spielberg refused the offer, and Kubrick made plans to move forward with the film after he'd completed Eyes Wide Shut. It wasn't in the cards, however. Kubrick shut his own eyes to the world in the summer of 1999, just weeks after delivering the final cut of his last masterpiece. It seemed that Kubrick's pet project, the one that held his passion and interest perhaps longer than any other, would die with him. But in early 2000, Kubrick's widow and his longtime friend and partner Jan Harlen approached Spielberg with a proposition�why not take Stanley up on his offer and direct A.I., a Stanley Kubrick production of a Steven Spielberg film. Spielberg, who'd been languishing for two years since the completion of Saving Private Ryan and toying with the idea of helming Harry Potter, jumped at the chance. He saw it not only as a creative challenge, but also as a way to honor the memory of one of the greatest directors of the 20th century. And so was born A.I., a celluloid contradiction�the cold cynicism of Kubrick meets the golden, sun-drenched humanity of Spielberg. And what a potent combination it is, for at its heart, this story is about nothing more than artificial love, and the consequences of loving something artificial. Kubrick could have made it, but it would be a different film, as he'd never been able to treat his characters with any more than icy indifference. Spielberg, on the other hand, is guilty of loving them too much. He's infused the film with many Kubrickian touches, certainly the same contempt for mankind, but only Spielberg could make it work, could trick the audience into falling for a simulacra of humanity. Haley Joel Osment plays a robot child, David, the first of his kind�programmed to love whoever imprints him. He is sent to live with a young couple, Monica (O'Connor) and Henry (Robards), parents caught in a cycle of mourning as their flesh and blood child lies cryogenically frozen, the victim of a debilitating disease. David is to serve not as a replacement, but as an outlet for grief, a comfort. Monica, despite herself, begins to grow attached to the child construct�after she imprints him, he becomes a constant companion. He ignores Henry; he focuses only on Mommy. And she falls for it, is drawn to his perfect, programmed love. Spielberg and cinematographer Janusz Kaminski shoot these early scenes with stark lighting, dulling the golden sheen of Americana and sentimentalism that so often overpowers the director's work. That reserved air towards the characters becomes more pronounced as David is suddenly thrust out into the world, driven from his family through no fault of his own, but simply an unfortunate coincidence of circumstance and programming. He's on his own except for Teddy, his Jiminy Cricket, a robotic bear that shows the same affection and dedication to David as he to his Mommy. The voice of Kubrick enters the picture when David runs into Gigolo Joe (Law), a mecha programmed not to give love, but pleasure. Kubrick always focused on the base, the carnal desires of humanity, and Gigolo Joe is the logical fulfillment of those desires, a robotic product of the id. David is convinced that Mommy will love him if he becomes a real boy, and sets out with Joe on a quest to find the Blue Fairy of Pinocchio fame (his favorite story). Joe doesn't understand David's wishes, but he'll come along anyway, if only to provide his services to the Fairy. "She'll make you into a boy because I'll have made her into a woman," he says, and their journey leads them throughout the world, from the garish Flesh Fair, where damaged robots are destroyed for sport to the delight of the watching human throng, to Rouge City, the sexualized equivalent of Pleasure Island, to a New York drowned in an ocean swollen from the melting of the ice caps. Throughout his journey, David travels through the most elaborate and believably grimy imagining of the future since Blade Runner. The special effects wizards at ILM, along with production designer Rick Carter, have worked wonders with the initial concepts Kubrick developed so long ago. Rouge City in particular is a visual marvel, a garish, sterilized sexual wonderland, where the building are women with legs spread to allow entrance and everything is neon and unreal. The devastated New York, which has gained an unintended eerie poignancy in the last year, is a sight to behold, the towering buildings standing defiantly out of the water, a lasting symbol of man's fallibility. A.I. could not exist without Haley Joel Osment's performance. He's even more impressive than he was in The Sixth Sense. His David is not a boy searching for love, but a robotic boy trying to carry out his programming, and Osment clearly understands, and masterfully portrays, the essential difference. David isn't robotic, but he isn't human either. Equally worthy of praise is Jude Law, who injects a playfulness into Gigolo Joe that is undercut by an ominous menace ("They hate us, you know, the humans. We are suffering for the mistakes they made because when the end comes, all that will be left is us," he tells David). Frances O'Connor also contributes to a vital, difficult role�Monica is the object of David's idealized love, but she is anything but the idealized mother�and O'Conner injects her with the perfect combination of conflict and heartbreak. It is David's story, but Monica is the soul of the movie.Upon release, A.I. met with sharply divided audience reaction, and, for the moment, the naysayers seem to have overpowered the film's champions. Admittedly, it's not perfect. There are some significant structural problems, and the first act especially feels alternately overlong and rushed. At times unwieldy, the film seems constantly on the verge of breaking down, the warring sensibilities of Spielberg and Kubrick imploding onscreen. Some say that, at the end, it does just that. But then, the same was said about 2001: A Space Odyssey, and while the denouement of A.I. isn't nearly as maddeningly complex, it carries equal subtleties certainly not apparent without a lot of thought from the audience (and even then, it really all comes down to a matter of interpretation). And here's mine, my answer to the critics who see this as little more than a warmed-over fairy tale: David's quest for humanity would seem to drive the picture (the allusion to Pinocchio is more than subtle, it's downright blatant). But really, it's nothing more than the culmination of his programming. He can do nothing but love Monica, and somehow he's gotten it into his subroutines that becoming real will help him accomplish his goal. Spielberg realizes this, of course, and the controversial ending is staged and shot in a way that feels like vintage Spielberg. Some will say that they can feel the director going for the manipulative, tear-jerker moment�John Williams' score at the finale does everything but break into "When You Wish Upon a Star." But what he is really doing is illustrating, in rich, oversaturated, unreal colors, the power of our emotions to trick us. In context, it's clearly an ironic commentary, undeniably Kubrickian. Does David fulfill his quest? Do his feelings become "real?" Emotions, so easily fooled, so fallible, are they the essence of humanity? It is this question that lies at the heart of A.I. Emotions make us weak, but they also make us human. Image Transfer Review: The transfer on this disc isn't one that you'd use as reference material, but any perceived flaws are more the result of the way the film was shot than any errors in the transition to DVD. Each of the film's three acts has a different visual look, and the third in particular shows a lot of intentional grain. Portions of the image have a slight softness to them that, again, was present in the theater, but fine detail is nevertheless very good. On the other hand, the middle section is very slick, with bright, saturated colors. Throughout, blacks are very solid, and detail during darker scenes is excellent. I noticed no edge enhancement, which was a relief, and no compression artifacts or aliasing. Audio Transfer Review: The audio mix on this disc is as varied as the visual look. It's presented in both DD ES and DTS 6.1 EX, and though I only have a 5.1 setup, I can easily say that this is one of the better tracks I have heard recently. It isn't an action-intensive track with lots of explosions and such, but the mix does support the innovative sound design very well. First of all, dialogue is very clean throughout, anchored in the center and always clear. John William's score is spread over the very wide front soundstage, with occasional support in the surrounds. The effects are impressively integrated, with subtle use of directional, panning, and front to back effects. The surrounds and the mains blend together very smoothly, and the effects don't come off as too showy. The louder scenes (ie, the Flesh Fair) make good use of LFE channels. All the elements of this track work together to provide an audio mix that is totally immersive. And kudos to DreamWorks for finally allowing audio tracks to be selectable on the fly. Extras Review: I'm going to start the extras review by telling you what you aren't going to find on this 2-disc set. First, there is no mention at all of the extremely popular and complicated interactive game/Internet marketing strategy (aka "The Beast"), which was basically a vast Internet mystery using websites and characters expanded from themes in the film (but taking place around thirty years after David was first built). Of course, it would have been very difficult to make it work in a self-contained DVD-ROM, but some mention of it, or a look at some of the websites (which were very imaginative and are, sadly, mostly offline now), would have been appreciated. There is also no DVD-ROM support at all, and nothing in terms of previous treatments of the script (which is rumored to have been rewritten, at Kubrick's request, by several different writers over 10 years). Spielberg was involved in much of this, at one point getting a private fax installed in his closet to receive concepts, storyboards, and treatments directly from Kubrick. I suspect the exclusion has something to do with the sworn oath of secrecy between Spielberg and Kubrick regarding the project�Kubrick told him that their personal and professional relationship would be over if he talked to anyone about the film. That doesn't mean that none of the material survived, as there is concept art from this period for sequences that ended up in the finished film, but there is little in terms of "what might have been. "The lack of supplements listed above notwithstanding, this is an excellent disc, one of the few that actually has extras I wanted to watch all the way through. On DVDs today, so often a PR promo is passed off as a "making-of documentary" or we get lots of little featurettes that add up to around 10 minutes of real, useful information. All of the A.I. supplements were produced, written, and directed by Laurent Bouzereau, who has directed countless such documentaries, including those on the Jaws and Jurassic Park DVDs. His usual style is still present (a lot of interviews, played over archive material, footage from the film, ect. ), and all of the pieces benefit from the unlimited access he was given to the set during filming. There is enough on-set footage that this never feels simply like a set of talking heads. And while the material is broken down into smaller featurettes, each is wonderfully edited to both stand alone and fit within the larger framework of the extras package as a whole. While most of the features are on the second disc, the first does contain a nice 12-minute featurette with Spielberg; executive producer, and long time friend of Kubrick, Jan Harlan; and producer Kathleen Kennedy. Here, Spielberg discusses his relationship with Kubrick, and some of the history of its legendary development. In this segment, we do get a few glimpses of unused characters designs and storyboards, and some talk of previous treatments, but nothing major. Still, it is very interesting, if only to hear the personal stories of Spielberg and Harlan and their dealings with Kubrick. Everything else is on disc two. All told, there is about two hours of documentary footage along with several extensive still galleries. The featurettes are divided up by section.Under the subhead Acting A.I. are two featurettes. "A Portrait of David" runs nine minutes, and focuses on the creation of the character, from concept to filming. There is some great stuff here, including information on Kubrick's original plan for the boy (to actually build a robot), to Haley Joel Osment's insights into the character. Usually comments from a child actor would be nothing to get excited about, but this kid is freaky. Also housed here is "A Portrait of Gigolo Joe," which is structured the same, but focused on Jude Law's pleasure robot. There is some talk here of the original Kubrick concept for the character, who would've been much darker and more menacing. This segment runs six minutes.Designing A.I. houses two more featurettes. "A.I. : From Drawings to Sets" runs seven minutes and deals with Rick Carter's gorgeous production design. There is more information about the Kubrick treatments here through interviews with comic book artist Chris "Fangorn" Baker. A lot of the focus is on the development of Rouge City, from paintings, to sets, to the ILM CGI additions. There is also a bit of talk about locations from the end of the film, and the difficultly in capturing them onscreen. "Dressing A.I." is a five-minute piece on costumer designer Bob Ringwood and his concepts for each character, from David, to Monica, to Gigolo Joe (whose jacket is actually made of woven fishing line!). 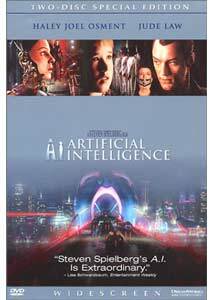 The next segment, Lighting A.I., is another five-minute piece, this one focusing on director of photography Janusz Kaminski and his contributions to the film's visual style. He talks a bit about the way the film is segmented and how he tried to give each one a unique look appropriate to the intended tone. He's quite a character, to, with his dorky glasses and giant scarf.Special Effects is an eight minute piece that deals with the on-set practical effects (which are so ignored in these days of computer wizardry). Michael Lantieri, award-winning effects producer for Jurassic Park, talks about shooting the practical effects in the Flesh Fair and climax sequences. Interesting, if only because we rarely hear about this kind of work being done anymore�every DVD focuses on the CGI side of things.Not that this disc ignores the CGI aspects, as Special Visual Effects and Animation: ILM has the longest running time of any area on the disc. The section is broken down into five featurettes. Effects wizard Dennis Muren provides a five-minute overview that offers a few more tidbits about Kubrick's involvement with the project�he focuses mostly on the pre-visualization. He also quite candidly comments that he was glad to be working with Spielberg because it actually meant the film would get made. "Robots" runs three minutes and deals with the process of adding CGI enhancements to the actors playing damaged mecha (a fascinating process). "Miniatures" is another very interesting segment. With a running time of four minutes, it covers the role models played in several key scenes, and how they were integrated into the finished footage (seamlessly, I might add, since I assumed it was all CGI). "New York City Shot Progression" is the traditional how-to on CGI, complete with an ILM techie sitting at his computer running through shots with us. It's all still interesting, but this featurette is the most familiar to me (basically the same thing was done for the Jurassic Park III DVD). Finally, "Animating A.I.," the longest piece at eight minutes, covers the sections that involved totally computer generated characters and effects. Featured prominently are Teddy (who was actually either a computerized puppet or totally digital, depending on the scene), Dr. Know, and elements at the end of the film. This segment is great, as it deals a lot with the Stan Winston team of animatronics artists, proving that there are things traditional artists can do that CGI as yet cannot. Robots of A.I., a nicely lengthy 13-minute featurette, also features quite a bit of footage from the Winston studios. Time is spent discussing the creation of various animatronic robots, including Teddy (there is even a "Heads of Teddy" gallery). While most of this section is fascinating, two things about it bug me. For one, many of the actors playing robots were real amputees, acting as robots missing limbs, and people keep describing them as "inspiring." I hate it when disabled people are labeled as inspirational figures who have overcome, ect. They are just people. Also, there is talk of original makeup concepts for Gigolo Joe that were much more artificial than those used, but there isn't any footage of them.The final major section is entitled Sound and Music of A.I. and is broken down further into two featurettes. "Sound Design" runs seven minutes, and allows amazingly talented (and award-winning) sound designer Gary Rydstrom to talk a bit about his working process on a film as complex and ambitious as this one. He talks about his lengthy involvement with the project from the start of filming (usually the sound design doesn't happen until the film has wrapped). There's also lots of footage of him at the mixing board, and it is great to see the man at work. "The Music" is a six-minute John Williams interview that covers the evolution of his rather unconventional score, one quite unlike anything he has done before. A final brief piece, Our Responsibility to Artificial Intelligence runs concurrently with the disc credits and features Spielberg's ruminations on real-life issues at the center of the film (namely, if man creates artificial intelligence, what are the consequences and responsibilities). Kind of weird, but it is interesting to see the director fly off on a tangent.We're done with the video features, and yet, not the disc. Aside from detailed cast and filmmaker bios and filmographies and some lengthy production notes (about 35 screens), there is one final subsection, this one called the A.I. Archives. Housed here are the teaser and full trailers (but sadly, none of the nifty TV spots, which I loved and watched repeatedly on-line) and six still galleries that, all told, feature around 250 images. "Storyboards" has basic boards from three different scenes that all take place towards the end of the film. Chris Baker's portfolio features the concept art the artist produced for Kubrick during the 1990s. Images are divided into seven categories, and there is some really cool unused material visible here. The "Production Design Portfolio" features mostly fully produced artwork (suitable for framing! ), divided into nine sections. "ILM Portfolio" is also segmented, and it houses special effects artwork and renders. Finally, two sections hold production photographs taken by David James. "Portrait Gallery" features publicity stills, and "Steven Spielberg Behind the Scenes" has about ten goofy sequenced shots of Spielberg with both hands up, framing shots, and looking like he's about to hand over his wallet. Quibble all you want about missing material�that's still a pretty impressive collection of extras. Many have complained that there isn't enough perspective on the project, just the usual effects featurettes. The beauty is, though, that Bouzereau has deftly woven that information into each section of the disc, so we get not just Spielberg's take on working with Kubrick, but everyone else's as well. Yes, I wanted to have a look at script treatments too, but their omission does little to hurt the overall package.DVD producer Mark Rowen has tied all of this material together with a user-friendly, logical layout and elegant menus featuring beautiful but functional background animation and transitions. The menus on disc one carry the clean, white, sterile look of the beginning of the film, while those on disc two have the gritty feel of Rouge City. Rarely do I find a disc that interests me so that I actually devour all of the extras in one sitting (even the still galleries). A.I. 's second disc is so well put together, I wouldn't mind doing it again. Film fans will likely debate for years what Stanley Kubrick's version of A.I. would've been. I'm just glad I got to see Spielberg's. A cinematic vision that is breathtaking to behold, it is a step forward for Spielberg and certainly his most ambitious project to date. Audiences were polarized by the alternately distant and emotional tone, and critics seemed largely unsure what to say about it, calling it some variation of "captivating, but deeply flawed." Perhaps it will gain respect in critic's circles over the years (as have many of Kubrick's films), but it already has mine. A.I. is a fully realized fable of the future and a remarkable movie.